The Summer Sale cards drop when you vote on games you want to buy, or spend money on games. Subtle. As part of the Steam summer sale, which ends tomorrow, the service has released publicly the trading card system that’s been in beta for a few months. It works like this: participating games have a ‘badge’ that you can acquire for your profile, and that contributes to a recently introduced level system. You get the badge by collecting cards – virtual items that land in your inventory – and crafting them together, and in the process you might get a special emoticon you can use in chat as well. You can get up to half the cards you need by playing the game, and the rest you have to trade with friends or buy on the community market. You can make the same badge multiple times, earning you more experience points towards your level and getting you a new image. And if you’re high enough level, you have a chance at getting booster packs that contain several cards, or foil cards that can be combined for an extra special badge. Let’s be absolutely clear here: we are talking about .jpgs on screens. Collections of pixels. Every time someone buys a card, Steam gets a cut – and I assume so do the game devs. People who don’t care about the cards get a chance at making some very easy money – pennies at a time, perhaps more if they get a rare drop. People who care a lot can plough time and money into buying rare pictures. 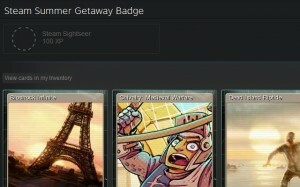 People who feel like making money off this can play the market – that’s already happening with the summer sale cards, as they’re high enough volume to sit at a stable price, but folks are only making a penny or two at a time. But once the economy starts to settle down, some folks will get good enough at it that they won’t need to pay real money for games ever again. Some people will most likely write bots to autobuy items below a certain price, too, once prices start to stabilise more broadly. If it’s successful – and it looks successful, right now – it’ll become its own market, the way MMO trading posts do, algorithmic trading and all. At the moment, badges aren’t tied to achievements – special pictures unlocked when you do something specific within games – so there’s no gameplay tie. In part that’s likely to be because achievement cheating is so common, devaluing achievements as a participation mechanic. But the flip side is that you can get card drops just by having a game open – you don’t need to be actively playing it – so plenty of people are leaving their computers on with card-dropping games open, and idle. Games they’ve not yet played, or games they’ve played to death and don’t want to have to go back to in order to get the new special picture. It’s not a bad way of making a bit of pocket money. Incidentally, the :weed: emoticon, which drops from the Port Royale 3 badge, is going for $10. People really, really like special internet pictures.